This is such a great example of the Animal-Human Connection. Every time an animal gives birth, it serves as a beautiful reminder of the circle of life. Suddenly, a new being has been brought into this world, bringing hope to future generations of the species. And as humans who are also Animal Advocates, this is such a great treat to be able to share in the excitement of new and precious life. Each new life is special, but the arrival of a baby from an endangered animal is even more joyous. When Lun Lun, a 15-year-old giant panda at Zoo Atlanta, became pregnant, the staff was thrilled. Giant pandas are critically endangered, so these caregivers were eager to welcome the new cub with open arms. However, they quickly realized that Lun Lun’s offspring would be no ordinary newborn. Photo credit Atlanta Zoo. 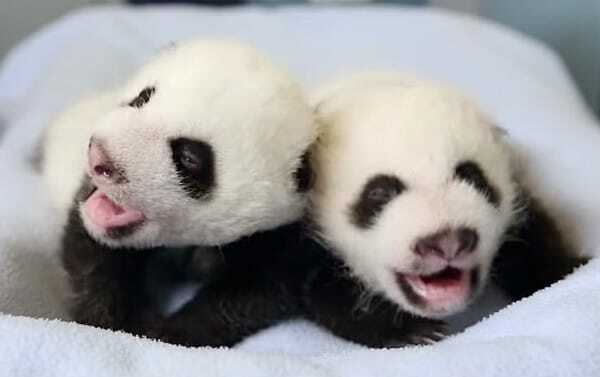 New born baby pandas surprise zoo workers and the world of animal lovers. …the incredible mama panda gave birth to a second baby moments later! This rare and special event made the female cubs, Mei Lun and Mei Huan, the first set of panda twins born in the U.S. since 1987. There are less than 2,000 pandas left in the wild, so this double birth was truly a reason to celebrate. This is great news to share with Animal Advocates all over the world. The good news of new births of an almost extinct species is something to be celebrated. Give your own pet a special bone or treat to celebrate. PS: We would appreciate you checking out our YouTube channel and subscribing. You will find it at www.judywright.tv and keep your eyes peeled for some exciting videos coming about the Animal-Human Connection. PSS: Thanks for being kind, thoughtful and respectful of all life–2 legged and 4 legged. You are invited to join our pack of animal lovers and protectors. Please share your email in the box at the top of the page. You will be connected to many pet people who want Respect, Responsibility, and Resilience in life. This is the foundation of all the work and service done by Judy Helm Wright, an author, speaker and intuitive wise woman. Discover more about the books, eCourses and programs offered by www.JudyHWright.com You will always be glad you did. You will also want to check out www.Pawtree.com/animalhumanconnection for a full listing of pure pet nutrition.